By placing the character locations and schedules on Character Locator, it was my hope to help some people locate their favorite character more easily. Some characters were listed on the Times Guide, but others are left off the Times Guide. This makes some characters more rare and hard to find at Walt Disney World. The official Disney line was “ask a Cast Member.” That can be helpful at times, but other times the hard-working cast members just don’t know the answers or haven’t worked there long enough to answer guests questions. At other times the schedules were guarded like State secrets in a black box with handcuffs attached. Recently, one twitter follower said she was given 5 different answers when she asked where Mary Poppins was meeting. I hoped to help people know where to go and when to go there to meet their favorite characters. It was my experience on Ultimate Tours that character meets were always the longest lines, even when the meets were well-planned. Of course, we were trying to do EVERY attraction and EVERY character in the same day which we first accomplished in June, 2011. Currently, there are about 60 different characters available for regular, scheduled, in-park meets. There another several characters that can be met by paying a fee for a meal or character experience that don’t meet regularly. But, what about the “Rare” characters? Where do they meet and how can you find them? Some characters like Abby Mallard, Angelica, Chicken Little, Iridessa, Kim Possible and Ron Stoppable, Prince Caspian, Rhino, Silvermist and the Power Rangers are just EXTREMELY RARE or impossible to meet in Walt Disney World. But there are other characters who do show up from time to time in set locations, but NO SET SCHEDULES. Well, no set schedules that most of the public will see. Some characters may only appear once or twice a year like Li Shang (right before Christmas parade) or Shan-Yu in Epcot. 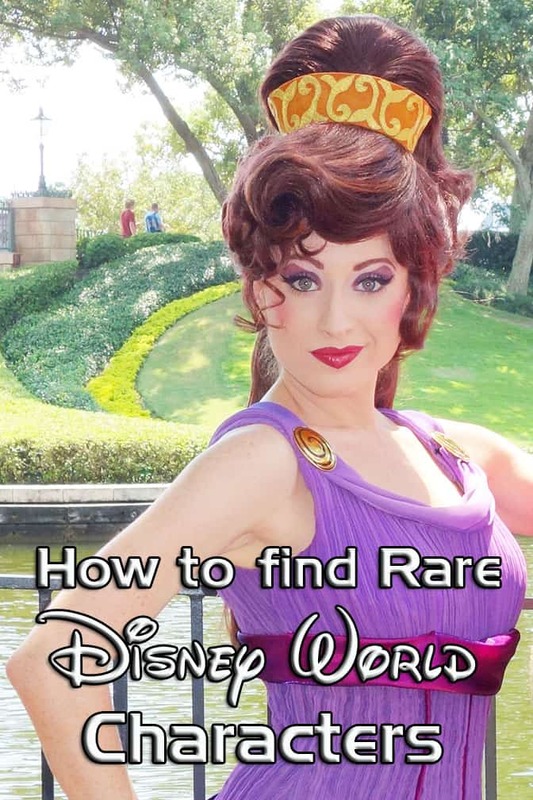 Recently, Eric appeared for several meets in Epcot and in the past Hercules and Megara might pop in once or twice a year. Other characters who regularly appear in the parks use Epcot to train their attendants and photographers. One might also see characters training for the Halloween Party in mid-August in Epcot or Animal Kingdom. A rare, random meet, like seeing Mushu in Epcot might happen from time to time, but the list below are characters that are a bit more difficult to find. Maybe you’ll get lucky and find Governor Ratcliffe in Animal Kingdom or the Brers at the Frontierland Hoedown. With the help of a good friend, I was able to compose this non-exhaustive list of characters who don’t make scheduled appearances, but are most likely to appear in a park. Be sure to check out Character Locator for great character info and schedules! 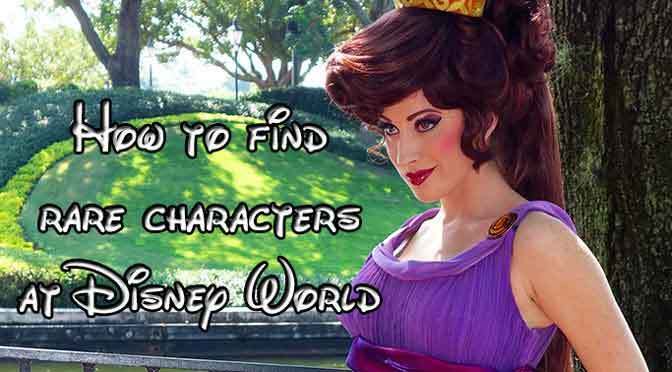 These characters are considered more difficult to locate in Disney World. Epcot Training meets may not happen daily, but the regular times are included on Character Locator. Frontierland Hoedown is a scheduled experience that often allows a brief time of meet and greets it’s included with Character Locator subscription. Character Palooza is a great meet and greet at Hollywood Studios. Schedules vary, be sure to check Character Locator on your week of travel. Is there any chance whatsoever of seeing Ursula? She is my 4 year old daughter’s absolute favorite character. I told her we probably won’t see her but would love to surprise her if possible. When I was at disney in 2007, we had a dinner scheduled in cinderella’s castle one night. We got there about 20 minutes early to check in and they were so far behind. Everyone there was really upset and in sour moods. The next thing we saw was Mary Poppins and Bert walk in the room. They started dancing and having a sing a long with all of us . Then suddenly 4 people dressed as penguins walked in and did a whole dance number with Bert. It was such a fun surprise and a great way to lift our spirits for the wait. Disney really knows how to make us feel good and that we matter. It was so fun. I’m almost 60. I never knew until today, that the queen in Snow White had a name. I thought she was just “the evil queen”. Thanks! You can usually find Jessie with Woody in Frontierland in MK. We’ve met rabbit during electrical parade one night when it was raining on and off at that character meet and greet near lady and the tramp restaurant in mk. Rabbit randomly appears at the Tigger meet in MK and Epcot Training now. A couple years ago yes. We met them in a special skin built across from the old Swiss family Robinson tree house. It was right as you went toward Aladdin. We thought it was a rude but it was a pixie hollow meet and greet. We met the pink fairy? Forget her name. With like the auburn hair. Pixies moved out a long time ago. It’s just Tink in Town Square Theater now. Where would i find characters like Gaston,Merida,and Jessie ? Or Sully and Mikewazoski, Mowgli, baymax etc. Gaston was my absolute fav to meet. Where can I find Jiminy Cricket? Is it possible to meet other thinkerbell characters? We met Meg one time in a corner of Epcot while taking the kids to the bathroom, no one was around & my kids got to spend a good amount of time with her we had no idea she was a rare character at the time. This was in 2011. Med is my favorite too, but I’ve never got to meet her. Just wanted to let you know that Pain and Panic appear on a float in the Boo to You parade during MNSSHP. At least they did when I was there a year ago.. Meg has appeared with Hades at events like Villains Unleashed in the past, but Kenny is right, almost impossible to predict. Does DisneyWorld still have Kim Possible and Ron? I have been trying to find characters from the Hunchback of Notre Dame such as Quasimodo for a while now. Does anyone know where to find Quasi? Epcot Character Training is always a fun find. Is there an app to use in the park to find these characters? My son just recently watched Bolt and I figures the odds of seeing him would be slim to none. Yes, http://www.characterlocator.com is the only app that shows full schedules for all characters in the parks. However, really rare characters don’t have schedules. Character Palooza does. Epcot Character Training doesn’t. Do You know how to find Kida (from the movie Atlantis)? You can also meet Lilo and Stitch at Typhoon lagoon during the spring and I think they are there till summer. Yes, they usually appear from around Easter through Labor day. Kenny, I have just about all of the Winnie the Pooh characters: Pooh, Tigger, Piglet, Eeyore and Darby. I would love to add Rabbit to my character photos, and maybe Governor Ratcliffe. Any good chance they can pop up soon? Disney World will be having their 45th anniversary next year, and I think they should have Long Friends Week again like they did two years ago. I’d love to see Rabbit with Pooh and the gang, including Christopher Robin, Governor Ratcliffe, John Smith, Meeko, and Pocahontas together, The Big Bad Wolf and the Three Little Pigs(need to add them to my list), and finally have Robin Hood and crew return, but this time bring back Little John too, and I think he qualifies for Long Lost Friends Week too. Thanks Kenny. Jason Broadway. Ratcliffe was out last week. Rabbit pops up a few times a month, but no way of predicting it. You won’t find John Smith or Christopher Robin at a meet. Wolf and Pigs are really rare. I heard that the Beast can be seen in human form at Disneyland Paris. I was at Animal Kingdom the other day and saw Ratclffe with Meeko. It was in the corner to entrance plaza right after bag security check but before enter with your ticket. It was second time I seen them there as I saw them there about 2-3 months ago. Also once in while Timmon will come out in the dance party in Dinoland in front of the gift store. I know as I was there and took pictures and all. Anyways I go to Disney about every week as I have annual pass, plus I recently moved to Orlando back in April so I go the park all the time now. I also now work for the parks as I got job there back in summer. I been wanting work for Disney for long time so you can say its dream come true for me! I love it more than any other job I had in past. When I was Epcot center one day in the spring early this year, I saw Eric. He was with Ariel in the Charcter Spot building. It was around close where the restrooms and rest area in the building is. I went in there one day on day it was raining and happen to see Ariel and Eric. It was just rare occasion I saw Eric with Ariel. Also Ariel usually don’t appear at Epcot unless you go to princess charter dining in Norway. It was first time I saw Eric in two years. Last time I saw him was at Magic Kingdom a couple years before the new Fanstyland came to be. What about Timon and Governer Ratcliffe at Animal Kingdom? They make random appearences there? At MVMCP Dec. 2013 we saw several characters that I was told are hard to come by: All of the 7 Dwarves together, Scrooge McDuck with Donald and Daisy dressed in winter clothes, and princesses with their princes (Rapunzel, Snow White, Cinderella, Aurora). The MVMCP parades featured characters I didn’t see again during our entire visit: Naveen, Beast, Burt from Mary Poppins with the penguins, Jafar, Genie, Gepetto and Jimminy Cricket. Going during that special event was absolutely worth the extra cost, for many reasons, and I would highly recommend it. During that trip, but not at that event, at Hollywood Studios, we saw Wreck it Ralph and Vanellope (they had their own permanent set inside so it didn’t seem rare) and Sorcerer Mickey. Also Stitch and Eeyore were at HS. It’s fun to find your favorite characters in different costumes (like Chip and Dale in scarves) and it was a good time for that too. Sorry it you’ve mentioned it already but don’t forget that if you have a Disney Visa card, you can go each day of your visit to the cardmember exclusive meet and greet. You don’t know who you’ll get until you get into the room but it’s a great photo op with classic characters (there were always several). And you get a copy of the photo for free! I’ve also seen random training Meet and Greets outside Great Movie Ride tucked off to the left behind some of the walls. These were not a part of Characterpalooza. It was always just one character at a time. I met Meeko and Max that way! Also, if for some reason the Beauty and the Beast show in Studios cannot be performed (it was down for a few days during my CP), they will have the characters come out and meet you. This includes Chip, Lumiere, and Cogsworth who rotate with Belle and the Beast. Another good way to meet uncommon characters is to sign up for a runDisney event. The last few years the Princess Race has featured pit stops with Barbossa and Capt Jack as well as a hero M&G with Shang, Eric, Hercules, Aladdin, Flynn Rider and John Smith. Last year the post-race party for Wine and Dine included groups of characters like Mushu and Mulan, Tiana, Louis and Naveen, Belle was even out with Beast in her sparkling yellow ballgown. During the race, I was fortunate enough to get Vader and Boba Fett in front of Star Tours. I understand the Tower of Terror race also has some rare characters out and about. Yes, but make sure you train for the event so you don’t end up with injury and they are VERY expensive. A long time ago Maleficent used to appear at the Grand Floridian buffet breakfast at 1900 Park Fare. I have tons of photos with her from 2000. She’s my favorite villain. Also got to meet all 7 dwarfs that trip at Epcot. I think it’s sad how slimmed down the appearing characters have become. It’s not like Disney is hurting for money. I also met the wicked queen as the old hag from Snow White at MK on that trip! I agree that it’s sad how they just repeat the same character over and over now. They change the secondary (for lack of a better term) characters quite a bit. In 4 trips between 2005 & 2009 I saw a lot of characters doing meet & greets that don’t appear anymore… Jaffar, Kim Possible & Ron Stopable, Power Rangers, Robin Hood & Friar Tuck, Clarise, Chicken Little, Koda & Keni and a few others but my brain is drawing a blank right now. There are characters now that won’t be around in 5 years (Wreck-it-Ralph & Vanellope for example). Also the new area of Fantasyland has given more room for characters. Tinker Bell and friends weren’t regular 5-6 years ago. Goofy, Donald, Daisy and Minnie were merely moved in Magic Kingdom. Gaston was added while Marie was moved and Beast was made dining only. The Animal Kingdom received massive cuts and haven’t been replaced with meet. A couple months back they began offering the dance party there as a fill in for the Lion King show. Overall WDW has lost more than it’s gained. I wrote a detailed post about this last year. Most were lost due to FP+ requiring more performers for a specific character. Yes, some always have a short shelf life. I know for a fact that on April 7th Maleficent was out for a meet and greet at Characterpalooza. My roommate is a character attendant with that most days. There are a lot of names on this list that used to be regular’s in past years. A few I wish I stood in line for but didn’t, like Jafar and Dopey. Though I did get a nice picture of Dopey during my ’07 trip, but I didn’t get him with me. A lot of characters were removed from in park meets over the last 3 years. Animal Kingdom lost more than any park. I would love to meet any character from The Hunchback of Notre Dame. Are they 100% out of circulation even for special events? Do you know where you can find the Beast as a human? Those are special events and require an additional ticket and there’s no way to know what characters arrive in advance. Do you know where Governer Ratcliffe can rarely do meet and greets in Walt Disney World? Any tips on how to find John Smith,Shang,or Prince Eric? Can some of the little einstiens appear randomly for character palooza? My daughter loves Robin Hood. Does he still appear anywhere? Thanks! Which characters are you most likely to find at Character Palooza. It’s currently on hiatus, but the list is here. I saw a lot of the Princesses, Pinocchio and Gepetto, Green Army are very common. sure wish I could meet thumper. Any thoughts? My friend did (her trip was a few weeks earlier than mine), but I wasn’t so lucky. ijn animal kingdom with girl bunny. did she have a name? Thanks! What’s the Villians Event & when is it? Also I’ve been to Mickey’s Not So Scary Before & she wasn’t there. Is it in the last 5 years that Jane is there? They are both my favorites and I’ve never seen them. :( Also is there anytime that Hercules is there? I’ve only seen him once. & What about Tarzan? Villains event is over it was 13th. Any tips on finding Megara or Esmeralda Oct 26- Nov 2nd? Thanks a lot! You won’t be able to find them unless Disney offers them for Limited Time Magic. Will the Villains sign at the 13 Reflections of Evil event? I was wondering if you could make an apple app of charcterlocator because I and a lot of other people have iPhones and would,love to have the app. Where could I meet the Beast, and where is this Epcot training you speak of?? Beast is only at Be Our Guest for dinner. Search Epcot Training on my site and you’ll find it. There’s full schedules and a Master List at the top of the blog as well. Is there an apple app for this character locator because I would love to get it. We’re working on iOS solutions. Step one is fully functional mobile site that should be ready very soon. Read some posts about it on front page. Is the teardrop in Magic Kingdom still being used as a character training site or has that been done away with since the opening of new fantasyland? Thanks Kenny. Has an alternate training spot been created in MK or is the only place to have these impromptu engagements with rarer characters now at Epcot ? No spot like that in mk these days. Rabbit, Penguins and Tweedles have appeared randomly in regular spots for their movies. I wondered if you have any insight… we saw Gideon last week in the Epcot training spot. Made me wonder, what is he training for? I could understand why King Louie, Baloo, Pooh, Pluto, Mickey would be there for training but wasn’t sure about Gideon. Does he have a M&G somewhere? I wondered just what he was training for? Or could it have been just for the handler? No photographers at the one we found, just Handlers with tags that said “Earning my Ears” and characters. Just an FYI that Terk and Timon were cut from MiSiCi just before Christmas. Sadly I don’t think a lot of people noticed. Thanks for the confirm. There were a couple others who mentioned that. I’ll need to update that post. Are there training meets for any rare face characters? Usually around a couple of weeks before they start the halloween parties, you’ll see some of those rare face characters in epcot or animal kingdom. When did they remove Stitch from Studios? He was still there in late September/early October 2012 when we were there. Can he be found anywhere now? My daughter loves him and we always have to have a photo with him when we visit. She’s going to be heart-broken if he’s gone for good. I meant Epcot ~ opps! Does he still meet at Studios? Stitch is still in Studios and Magic Kingdom. He was removed from EPCOT. Check the Character Schedules and Master List at the Top of the site. Saw MISICI yesterday and no Terk or Timon. Were they replaced by other characters or merely removed? No new characters. Looked like they just had dancers in their spots. 1) The last few times I have seen MISICI Terk and Timon were not present, and I had read on other blogs that they had been cut from the street party. Have they returned (or perhaps, were the rumors of their demise incorrect in the first place)? 2) You mention that 9 characters are available only through special meals/character experiences. I can only think of 7 (June, Agent Oso, Mad Hatter, Piglet, Prince Charming, Beast, Lilo). Who are the other 2 (or more, in case I was wrong about any of the 7 I mentioned) and where can you meet them? I can only say that Timon and Terk were in it on my last visit. Not sure if they were cut. Don’t know what blog mentioned that they were cut. Captain Hook and Mr. Smee through Pirates and Pals Voyage. Guess I’ll just have to check out MISICI again and see if they are around. Completely forgot about Pirates and Pals – definitely a cool way to meet a couple of great characters. Pan’s there too, but he can be met at MK of course. Plz let me know if you see that those characters are gone from Misici. I don’t want to provide inaccurate information. Caught the tail end of MISICI yesterday, and Terk and Timon were nowhere to be found. Obviously not conclusive, but it seems as though others here have had similar experiences recently. Hope that helps. Thanks Rob. I’ll strike them from the list for now to avoid confusion as it seems they aren’t appearing any longer. We met Piglet in Hollywood Studios a couple of years ago and we met the Beast in Epcot last Aug. Both were meet and greets with autographs and photos. Are they no longer on the character schedules? No the Pooh characters were removed from the Studios and Beast, Marie, and Stitch were removed from Epcot for regular meets. Marie too? Epcot in France was the only place I knew of to meet her. Does she have anywhere she is meeting now, like the Beast is at the Be Our Guest restaurant? Thanks! Your site is wonderful! I’m still making my way through all of your pictures and articles, haven’t made it to the character schedules yet! Lol! The character training at Epcot you’re talking about, would that be where they open up the gates and bring people inside and close them and let you meet and greet several characters? Because that happened to my family on our last trip to Disneyworld. Those giant gates that are scattered throughout the World Showcase in between countries opened up, something like eight characters came out, and then they brought us in, closed them up, and let a group of maybe 25-30 people (which included my group of 13) get pictures and autographs from all the characters. The cast member said it happens maybe once a month. We saw Donald, Mickey, Goofy, Brer Bear and Brer Fox, Gideon, Baloo, and Mr. Penguin. It was incredible. :-) Very special magical moment! There’s two of those training locations, one between Canada and UK and the other would be American Adventure. Characters also appear at the International Gateway, near the fountain and near Imagination. We couldnt find fairy godmother in true love week we were told to go to several different locations and ended up walking past her on the way to Alice after we gave up. Fairy Godmother usually appears behind the castle daily, but True Love Week and filming for Kelly and Michael relocated her temporarily. Did you find her by the castle wall? Any tips to meet Rabbit from the Hundred Acre Woods? Rabbit is a pretty rare one. If he appears it is most likely at Toy Soldier in Epcot or even more rare with Pooh in the Magic Kingdom. Thank you! I have someone who really wants to meet Rabbit and he’s proving to be elusive. Apparently a few weeks ago, he was at Crystal Palace for one day. Hoping to somehow track him down.